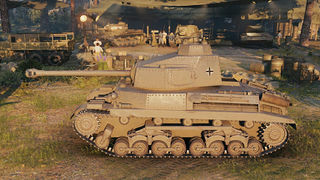 Der Turán III prototípus ist ein deutscher premium mittlerer Panzer der Stufe 5. Prototyp eines ungarischen mittleren Panzers des Zweiten Weltkriegs. Im Gegensatz zu vorherigen Ausführungen hatte er das Geschütz 75 mm 43.M mit langem Rohr und eine verbesserte Panzerung. Keine Serienfertigung, da der Fahrzeugbau in Ungarn im Sommer 1944 eingestellt wurde. The Turan III exemplifies the stealthy German sniper ideal like few other tanks; with its thin armor and low view range, the tank does poorly on the front line and must stay in the second line to perform well. Its accuracy of .39 is on the better end of the scale for Tier V mediums, so it serves best at a medium range in order to avoid return fire and get the most out of its shallow 32-round ammo rack. Its penetration and damage values are good; while not as powerful as the American-built M1A1 76mm, it is still sufficient for the majority of targets the Turan III can expect to face. 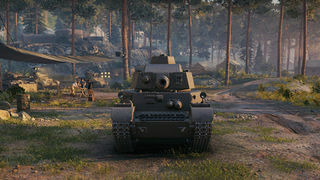 The main limitations of the tank are its low view range and mediocre agility; even the somewhat ungainly M4 can still out-turn it, meaning that the Turan III is not a brawler, and it should not be placed into situations where it has to fight enemies at close range. There are tier 3 lights with sufficient penetration and firepower to worry the Turan III, so it is far better to hang back and pick a spot somewhere between the tank destroyers and the scouts to engage the enemy. Fortunately, the Turan III has excellent HP and can survive a few hits, even from same-tier howitzers. Once tier 6 and 7 weaponry come into play, however, the Turan III's high hit points are hard to rely on. Its low weight and thin, flat armor mean that it is peculiarly vulnerable to ramming attacks. Compared to its competition with other tier V medium tanks using 75/76mm guns, it can claim good DPM and good aim time, better bloom control than most of its peers, and higher total health as its main advantages. However, it rates poor-to-average at best in all other categories, and thus has a much more difficult time 'carrying' games, even at its own tier. As a result, the Turan III needs spotters, teammates, and cooperation more than any other medium tank in its tier, even the Pz.Kpfw T25. Coordinated play with a platoon can go a long way to offsetting its shortcomings. It is extremely vulnerable on its own and badly outclassed when bottom tier, as its flanking ability is lacking and it can expect to face same-tier light tanks with enough firepower to challenge the Turan III. Its inability to turn quickly means that a Chaffee or Leopard can effortlessly circle a lone Turan III and severely damage or destroy it. Stay with allies whenever possible and serve as an opportunistic marksman--deal a few quick, accurate shots at opponents and duck away before they can return the favor. Let larger allies absorb hits (Japanese heavies are great for this!) while you take 100-HP bites out of the enemy. 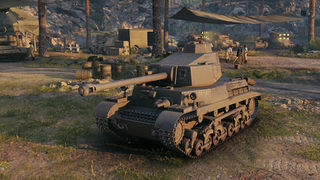 Overall, this tank plays similarly to the Japanese mid-tier medium tanks, focuses on providing supportive fire at range than brawling and flanking. The Turan III is elite in its stock configuration. In January 1943, after the mass production of the 41M. Turán II medium tank with the short barreled 75mm L/25 gun has begun, the first combat experiences showed that unfortunately these vehicles did not have enough firepower and protection against the most up-to-date Russian tanks and anti-tank guns either, even after the upgrade from the 40mm cannon of the Turán I. However, the Hungarian troops needed continuous tank replenishment, so the Hungarian Ministry of Defence just could not halt the – more or less still obsolete – Turán II production. At first, to resolve this problem, the Hungarians tried to convince their ally, Germany, to sell manufactured tanks or the production rights for one of their most advanced tank designs, for example the Pz. Kpfw. IV Ausf. H or the Pz. Kpfw. V Panther. Of course, Germany was unwilling to sell manufactured tanks in large numbers to any of their allies, because in 1943, they nearly couldn’t even produce enough combat vehicles for their own purposes. They did not have any advanced tanks to spare. In the production rights/licence issue, Germany was also unwilling to sell any of their advanced designs, because on one hand, at that time, the Pz. IV H and Pz. V designs were still in an immature state – the Hungarian delegation visited Germany in April 1943, the month when the production of the Ausf H. started, and the first version of the Panther, the Ausf. D was just in production for a few months. On the other hand, even if the Hungarian military leaders didn’t want to admit it, Hungarian industry was not advanced enough to produce such a complicated vehicle as the Panther. Plus, complete switch to a new product would have halted the assembly lines for months and the Hungarian Army could not afford such outage. - At first, to modify the existing Turán I and II design, or even already manufactured vehicle,s with additional (bolted on) armor plates and mounting a higher performance, long barrel 75mm cannon in a reshaped turret on them. This project became the Turán III. - In the meantime, while the factories manufacture the upgraded Turán, make a completely new, advanced tank design on their own, which could compete even against the most advanced enemy armour. This project resulted later the 44M. Tas medium tank. - mount the new 75mm 43 M. L/55 cannon on the same turret of the Turán I and II. - bolt additional armour plates on the most critical points of the armour, to increase the protection of the vehicle. That means for example on the frontal armour plate: increase from 50 mm to 80 mm. - add factory mounted, perforated 8mm side-skirts against the Soviet anti-tank rifles - increase the engine performance if possible. However, because of the lack of resources and development time, not every modification could be carried out. The abovementioned 75mm 43 M. L/55 tank gun was already under development at that time, thanks to the 43M. Zrínyi I assault gun project, that carried this exact cannon too. It was the slightly modified licensed version of the German 7,5cm Pak 40, which the Germans sold to Hungary after long negotiations. However, its development was very slow, so only two pieces were ever made by the DIMÁVAG factory in December 1943 before the end of the war – one for the Zrínyi I prototype and an other for the Turán III prototype – because of the continous malfunctions of the prototype guns. One of these two guns was used for the factory trials of the 44M. Tas too. The long 75mm gun simply could not be fitted in the turret of the Turán I or Turán II, so the engineers had to design a new, bigger turret, which meant that the earlier Turán versions could not get the new cannon so easily. The new, redesigned turret’s wooden prototype was completed in September 1943 and it was tested with a wooden dummy gun on a Turán II chassis with 2H-012 license plate. The turret ring diameter didn’t change, but the turret itself became wider, longer (to balance the longer gun), and much higher than the earlier Turán turrets. The strangely high turret design came from an earlier stage plan, where the redesigned turret got an additional “elevated” commander cupola, so the commander could command the vehicle while he’s standing. This idea was later rejected, but the “elevated” commander cupola remained and this made the shape of the turret rather odd. The early wooden prototype turret differed from the later “would be serial” turret in one part. Plus, it didn’t have factory mounted side skirts, unlike the planned serial vehicle. Note: Some older books says that there were an other prototype turret, which was more similar to the turret of the Turán II. This turret would have been able to carry one less (only 2 instead of 3) crew members because of the lack of inner space. However, I didn’t find any picture or details about it and newer books and articles didn’t say anything about this alternative turret, so it might be an incorrect information. To speed up the development, the thickness of the hull armour front plate and the gun mantlet was only increased from 50mm to 75 mm (25+25+25mm of bolted armor) instead of the desired 80. In addition, the thickness of the hull side armour, the frontal armour of the commander cupola and the turret side and rear armour were increased by a little bit as well. Unfortunately, the performance of original WM V-8H engine was not changed, because there was not enough time to develop it. And, because of the increased weight with the same engine, maximum speed decreased to 39 km/h. The first complete 43M. Turán III – also known as Turán 75 hosszú (=long) – prototype with the new turret, increased armor thickness, the long 75mm gun and additional 8mm thick side-skirts was finished in February 1944. However, because of the late war raw material shortage such as the necessary alloy elements and the decrease of production capacity due to the continuous Allied bombing runs against Hungarian industrial areas, no more Turán III tanks were ever created except that prototype even though some sources claim that another 4 or 5 Turán IIs were upgraded (up-armoured) to Turán IIIs, without the long 75mm gun. Sadly, the later fate of that Turán III is unknown. Bíró Ádám – Sárhidai Gyula: A Magyar Királyi Honvédség hazai gyártású páncélos harcjárművei 1914-1945. Budapest, 2012. 191-193. 217-220. Bombay László – Gyarmati József – Turcsányi Károly: Harckocsik 1916-tól napjainkig. Budapest, 1999. 101-102. Bíró Ádám: A Turán II és III harckocsicsalád I. rész. In: Haditechnika 1995/3. 65-70. Bíró Ádám: A Turán II és III harckocsicsalád II. rész. In: Haditechnika 1995/4. 60-68. Bonhardt Attila – Sárhidai Gyula – Winkler László: A Magyar Királyi Honvédség fegyverzete. Kecskemét, 1992. 92-93. Bonhardt Attila: Az m. kir. honvédség páncélos fegyvernemének gerince: a „Turán” harckocsicsalád. In: Haditechnika 1986/1. 36. A 7,5 cm 40 M. páncéltörő- 7,5 cm 43 M. harckocsi- és 7,5 cm 43 M. roham-ágyú lőtáblázata. Budapest, 1944 June.